The Rose Garden was the first garden established at The Gardens – in 1997 – and now contains approximately 450 roses. The center beds contain modern roses, mostly hybrid tea, floribunda, or grandiflora, while the outer beds hold antique and climbing roses. The central focal point is the Gloria Fischer Memorial Fountain dedicated in 2000. The garden peaks in May, and after a brief rest during the heat of the summer, bursts forth again in the fall. 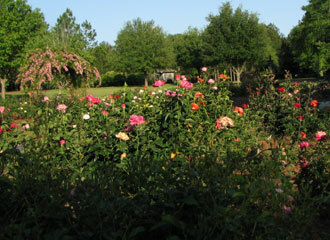 This garden is maintained by the Wiregrass Rose Society.